We don’t use ANY filters on our lenses when shooting unless we need one. The “Skylight”, “1A” or other type of “clear” filter used for “protection” purposes is very often the culprit of "soft" pictures. These filters often gather a LOT of smudges since they are so prominent in front of the lens. Plus MOST of these filters sold by camera stores are VERY LOW QUALITY and do impact the quality of your images. We only use filters when needed: A polarizer to cut reflections; a graduated neutral density filter for landscape images and a neutral density filter for shooting water falls. If you do insist on using a “protection” filter, make sure it’s a high-quality filter (multi-coated) and you keep it clean (we highly recommend using ROR and a microfiber cloth). When shooting hand-held with fairly stationary subjects, set the camera on “Program” mode or “Aperture Priority” mode. Then set the AF point in the viewfinder to the center point. Then, place the center AF point on your subject, press the shutter half-way. This will lock the focus and exposure in most cameras. Then, while holding the shutter half-way, re-compose the image and take the picture. This way YOU are in control of what is focused on. We almost always shoot this way. By far, this is the biggest issue with blurry images. The camera generally figures out how to expose each image. Exposure is dependent on how much light is on your subject and how the ISO speed is set on your camera. Given these two things, the camera then figures out how much light to let in to your camera’s sensor. It does this by adjusting the lens aperture and the shutter speed. If the shutter speed is too slow and you are hand-holding the camera, the image will be blurred! What shutter speed is “too slow” is dependent on several factors including how light/heavy the camera is, what lens focal length you are using, your ability to hold the camera steadily and how hard you press the shutter. There are several things you can do to help mitigate these factors. The best solution is a sturdy tripod (“sturdy” is an important word here – we’ve taught a LOT of people who bring tripods that are completely useless because they aren’t steady. Unfortunately, “steady” often translates to “expensive” when talking about tripods. A tripod isn’t always practical however. In these cases there are two other solutions. One is a bean bag. You can make your own by sewing two pieces of 8 inch square cloth together on three sides and putting a zipper on the fourth. Fill the bag with lentils or small beans. You can then rest the bean bag on something sturdy (rock, tree, table, etc) and put the camera on the bean bag. This will allow you to stabilize the camera and helps prevent camera movement during the exposure. Check out our “Green Pod” bean bag here). Another solution is the SteadePod. 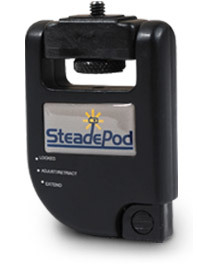 The SteadePod is a stainless steel wire that is held in a very compact case. The wire can be extended when taking pictures – you step on the end of the wire (there’s a flat “foot” support at the end of the wire) and you attach the other end to your camera’s tripod socket. You then place slight upward pressure on the camera which tightens the wire and helps stabilize the camera. It takes the place of a much larger monopod. You can see the SteadePod here.